Nissan has introduced the X-Trail Hybrid in Japan, equipped with a 2-liter MR20DD four-cylinder engine and an electric motor. The 2.0-liter gasoline engine delivers 147PS (145hp) at 6,000 rpm and 207Nm (153lb-ft) of torque from 4,400 rpm, while the RM31 electric motor has a maximum power output of 30 kW (40hp) and a maximum torque of 160Nm (118lb-ft). The hybrid system also includes a high-output lithium-ion battery which is able to charge/discharge quickly. In combination with an XTronic CVT, the hybrid powertrain achieves a fuel economy of 20.6 km/l (4.8 l/100 km or 48.5 mpg US) in the JC08 mode and meets Japan’s 2020 fuel economy standards, which means all grades are eligible for tax exemptions. Furthermore, the X-Trail Hybrid achieves a 75 percent reduction of NOx (nitrogen oxide) and NMHC (non-methane hydrocarbons) in exhaust emissions over 2005 standards and SU-LEV certification. The Nissan X-Trail Hybrid features Intelligent Dual Clutch Control, which is a two-clutch parallel hybrid system that delivers engine and motor energy mechanically to the transmission without having a motor assist or a torque converter, thus favoring responsive starts and acceleration. 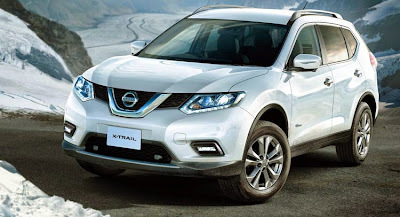 In terms of equipment, the Nissan X-Trail Hybrid gets Forward Emergency Braking as a standard feature, as well as the NissanConnect Navigation System, the latest generation in-car navigation, information and entertainment system with smartphone link application. Nissan is planning to also introduce Forward Emergency Braking as standard on major models in Japan, by the end of autumn 2015. The X-Trail Hybrid is priced from 2,804,760 yen ($23,415).